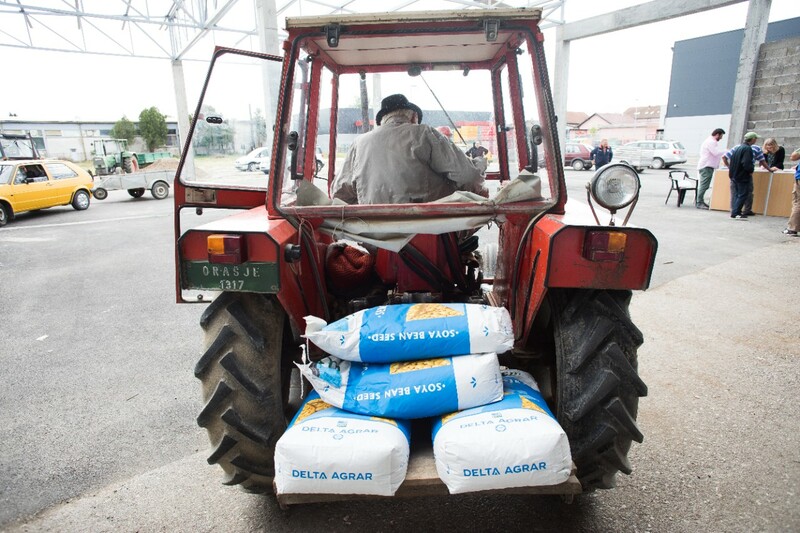 Within the scope of the Local Integrated Development project, the European Union and UNDP, in cooperation with the municipalities in Bosnia and Herzegovina, supported genetically non-modified soybean producers by way of procuring soybean seeds and liaising them with the market and purchasers. One of the producers who are supported by the project, Gavro Bradaščević, said that three years ago he decided to launch the production of soybeans. “In 2018 I had the first guaranteed purchase of products. This means that long before we even sowed the seeds, we knew the price of soybeans per kilogramme. It is up to us to choose whether to sow or not”, Bradašević says. Bradašević currently cultivates around 30 hectares of land near Modriča. In May, he became one of the producers of genetically non-modified soybeans supported through the Local Integrated Development project (LID), funded by the European Union, and implemented by the United Nations Development Programme (UNDP). New seeds helped him expand his crops, and he hopes to see new soybean producers and incentives. Soybeans production in Modriča has increased in the past years, and the neighbouring municipalities have seen a growing number of producers. In addition to Modriča, the Local Integrated Development project covers arable land in Odžak, Domaljevac, Gradiška and Orašje. On an area of over 1340 hectares of land, 238 farmers in the said municipalities planted seeds of genetically non-modified soybeans received through EU support. The project invested around BAM 230 000 (€115 000) in seed procurement, and the farmers earned close to 3 million BAM (€1,5 million). Therefore, the farmers who participated in the LID project had revenues of close to 2 200 BAM (€1 100) per hectare, which increased revenues of their households to around 10 000 BAM (€5 000). “Speaking of soybean production, the total quantity of this oil plant that could be produced in BiH represents “a drop in the ocean of the global production” and so BiH should definitely look for opportunities and competitiveness on the market of non-GM soybeans. Establishing a strong raw material basis for companies that are in the business of food production in BiH would also mean the strengthening of domestic producers. One of the criteria of product quality is also a non-GMO production, which is competitive on the domestic market and global market as well. Therefore, a non-GMO production is the future of a strong BiH agriculture“, said Nada Ević from the Ministry of Agriculture, Water Management and Forestry of Posavina Canton.